When you plot some data, it’s common to want to add a line to the chart to provide some context to the data. The line may represent a target value, a budget, a typical level, or some other reference. This tutorial will show how to create a chart with a horizontal line that appears behind the plotted data. … and I added this data as an XY Scatter series to the chart. It’s not too complicated, takes only a couple minutes once you know how. The problem with this easy approach is that the horizontal line cuts in front of the bars, and you may prefer to have the line behind the data. I originally had a more convoluted approach to the use of area chart series for this purpose. A long-time reader of my blog, Liu Wanxiang, had a simpler approach. His approach saves numerous steps and is easier to understand and explain, and there is no benefit to my original protocol. With Liu’s permission, I have modified the rest of this post. We can use an area chart instead of an XY chart to add the line. First I’ll show why it works, and then I’ll show how to do it. Let’s start with the same simple data and column chart. Now let’s add this data to the chart. The new series is added as another column chart series. When we change the second set of columns to an area type, the area is drawn behind the original columns. 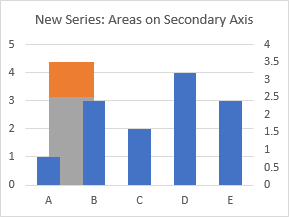 We will need to put the column and area series on different axes in order to make the area stretch to the edges of the chart while leaving the columns where they are. 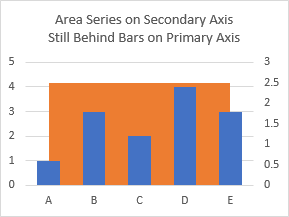 When the area series is plotted on the secondary axis, it still stays behind the bars. This is fortunate, because it keeps the protocol from becoming too complicated. We’ll modify the area chart data and just use endpoints 0 and 1. We’ll use a transparent fill and colored border on the area series. 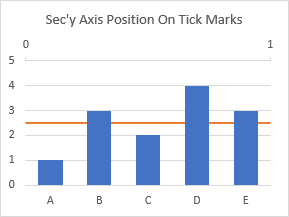 We’ll remove the secondary vertical axis but add a secondary horizontal axis above the chart, and we’ll adjust the tick positions of this secondary horizontal axis. I know it’s a lot of steps, and I’ll do them individually later when I show how to construct the chart. Note that the area’s border lies behind the bars, just as the filled area was behind the bars. But we see the other borders of this area chart, on the sides and bottom of the chart. How do we get rid of them? If we strip away the original columns for clarity, we see that a single area chart series gives us the outlines on all four sides of the area. 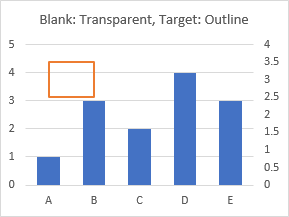 Let’s instead use two area chart series: Blank, which will eventually be blank instead of semitransparent as in the chart below, and Target stacked on Blank. Then we make the Target area transparent and give it the orange border we’ve been using for our target line. 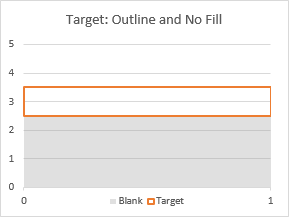 Change the height of the Target area to zero, so the top and bottom edges of the resulting rectangle coincide. This was the magical step of Liu’s approach: making the Target area series zero units tall. 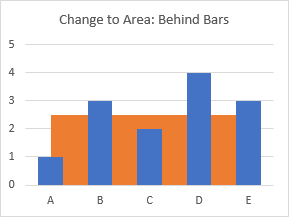 I didn’t even think of it, perhaps because old versions of Excel (2003 and earlier) treated the area chart shape differently. If it was zero height, either the line didn’t show up at all, or it showed up but was double the thickness, I don’t recall exactly which. Probably this was changed in Excel 2007, and I never noticed. And finally, make the Blank series blank (transparent, i.e., no fill). That’s exactly what we need: a single horizontal line at the desired Y position. Now let’s build the chart from scratch, step by step. Once again, we’ll begin with this simple data and column chart. Copy the data range, select the chart, and on the Home tab, click the Paste dropdown and select Paste Special. In the dialog, choose New Series, in Columns, Series Names in First Row and Categories in First Column. Blank and Target are added as more clustered columns. Right click on one of the added series, choose Change Series Chart Type from the pop up menu, change both to stacked areas, and place them on the secondary axis. 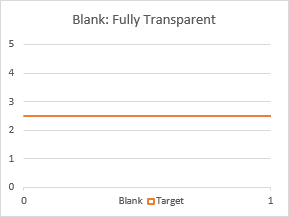 Format the Blank series to have no fill so it is transparent. Make Target also transparent, but give it a border. Now you can change the height of Target to zero. When you get good at this, you can just start out with zero. 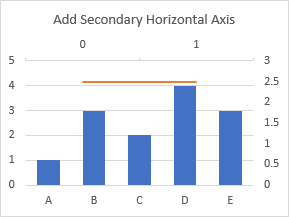 Excel added the secondary vertical axis but not the secondary horizontal axis. Click the floating plus icon next to the chart, click the arrow beside Axes, and check the secondary horizontal axis. Delete the secondary vertical axis (right edge of chart). The area series are now plotted along the primary vertical axis, so they are in sync with the columns. Adjust the secondary horizontal axis, choosing the On Tick Marks option for Axis Position. Now hide the secondary horizontal axis: format it to use no line and to have no labels. The final result, which is a bit more intricate to create than the chart with a horizontal line in front of the bars, is a chart with a horizontal line that lies behind the plotted data. 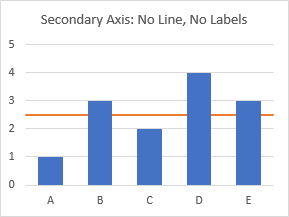 You can download an Excel workbook with a few methods for creating a horizontal line across your chart here: Horizontal-Line-Worksheet-2.xlsx. Posted: Tuesday, October 30th, 2018 under Combination Charts. Tags: reference lines, target lines. Jon, could you please give a download-link of the xlsx-file for this posting? See the link at the end of the article. em, I have a more easy solution . I will mail you a file, you will know my method. Thanks for your suggestion. It is in fact several steps quicker than my method and uses an easier trick with the secondary horizontal axis. Thanks for sharing this solution, I have followed your straightforward instructions with excellent result! Really like this technique. I would have tackled it by saving a jpeg of a white box with single coloured top edge and using it to fill the area series. Frequently use my library of boxes split into even thirds, quarters, etc. (either vertically or horizontally) in different colour schemes to use as background fill for various purposes. For example, I might want to show 4 quarters and then a year total and put that over a background box 4/5 white and 1/5 grey. I used to use that approach frequently, but it does not make it easy to make changes. You can’t easily reformat the color or thickness of the line, or the fill of a rectangular area. Using multiple stacked areas (or sometimes stacked columns or bars) is not too difficult, if you learn the tricks, and the reformatting is easier. Hi can you do a YouTube tutorial. The post is hard to follow.